A “Relay” is an digital output pin on the flight controller that can be switched between 0 volts and either 3.3V or 5V. Similar to a servo it allows the flight controller to invoke some action from another device on the vehicle. Up to 4 pins can be defined as relays. 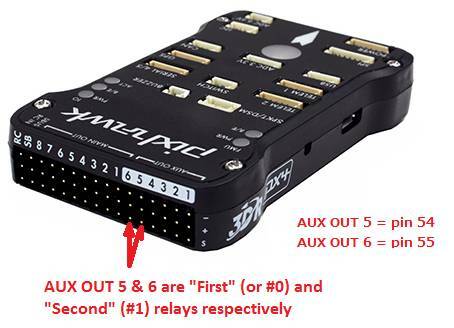 On the Pixhawk AUX OUT 5 (pin 54) and AUX OUT 6 (pin 55) are setup as the “First” (or #0) and “Second” (or #1) Relays respectively. The number of available Relays can be increased to a maximum of 6 by reducing the number of AUX pins used as Servo outputs. This can be accomplished by reducing the BRD_PWM_COUNT from 4 to 2 or 0. 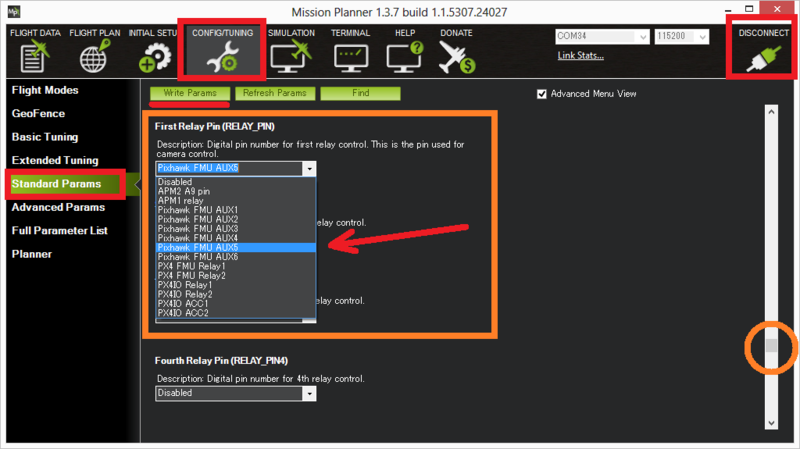 The First ~ Fourth relay pins can be defined most easily using the Mission Planner’s Config/Tuning screen’s Standard Params list as shown below. Alternatively if you know the exactly pin number to use, the RELAY_PIN parameter can be set directly. The relays can be controlled with the auxiliary switches. Similar to a servo, the Relays can be activated during a mission using the Do-Set-Relay mission command. This is described on the Copter Mission Command List wiki page.